Some people ask me "How much does life insurance cost?" without ever knowing what life insurance is or how it works. That's like walking into an electronics store and asking a clerk how much that gadget in the window costs, and then following up with "what does it do?" 2. How does life insurance work? 5. How do you get life insurance? Life insurance is a contract between you and the insurance company. In exchange for you paying the policy premiums the insurance company agrees to give your family, or beneficiaries, a specific sum of money if you pass away while the policy is active. Seems simple right? You pay premiums and they agree to pay your family a large sum of money if you die. The amount that gets paid to your family or beneficiary is call the “Death Benefit.” The premiums are your cost for the policy. The beneficiary of your policy is the person you want the insurance company to send the money to if you “walk on out.” And the active period of a policy can be anywhere from 1 year to your whole life. Great! Just one question. Why would any company want to pay out a large death benefit to someone in exchange for a set of monthly premiums that will add up to less than the amount that will be paid to the beneficiaries? After all, we know there are only two guarantees in life: taxes and death. This sounds like a good way for an insurance company to lose a lot of money. That brings us to the next question.. When Did Life Insurance Start? Around 600 B.C. the Greeks and Romans began forming Guilds, or “Benevolent Societies,” which cared for the families of deceased members and paid for their funerals. This became the origin of life and health insurance. This practice continued into the medieval ages, and in England “friendly societies” were formed. In these societies, members donated money into a pot that could be used to help members that experienced an emergency. Modern life insurance plans were started in the early 1700’s. The first life insurance company was “Amicable Society for a Perpetual Assurance Office” in London. So why would a life insurance company agree to a contract in which they pay out more than they collect in premiums? Because most policies end (or lapse) before the person being insured dies. The insurance company collects monthly premiums from every active policy and only a small percentage of those policies will result in a large death benefit payout. Data shows that less than 1% of the US population died in 2014 (http://www.livescience.com/3780-odds-dying.html). The vast majority of the remaining life contracts will simply end. The main reason policies lapse is because people stop paying their premiums. The falloff is pretty large in the first few years of the policy life. For temporary policies, 6.4% stop paying their premiums each year. For permanent policies, 3-5% stop paying premiums every year. Ultimately, 85% of all temporary policies lapse, and nearly 88% of permanent life policies end without a death benefit payment. A key point here is to make sure that your budget for life insurance premiums is reasonable, affordable, and an amount that you can pay even while times are difficult. 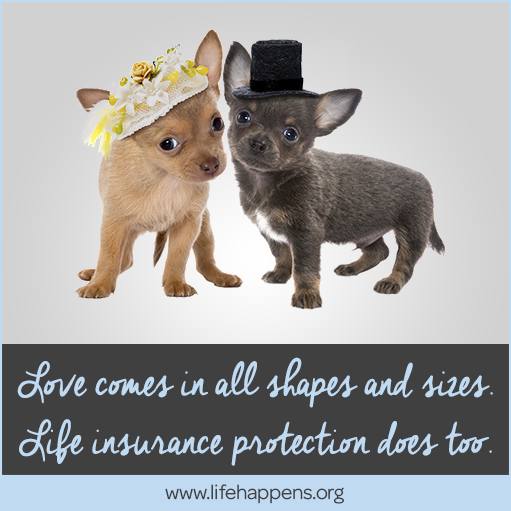 As we mentioned there are 2 types of life insurance. In the next section we’ll explain what they are and how they work. The two broad categories of life contracts are temporary and permanent. Temporary plans are designed to last for a specific number of years. Say 5 years to 30 years. Permanent policies are intended to last for the rest of your lifetime. Permanent plans can be broken into two categories: Whole Life, and Universal Life. Temporary plans are called Term Life. 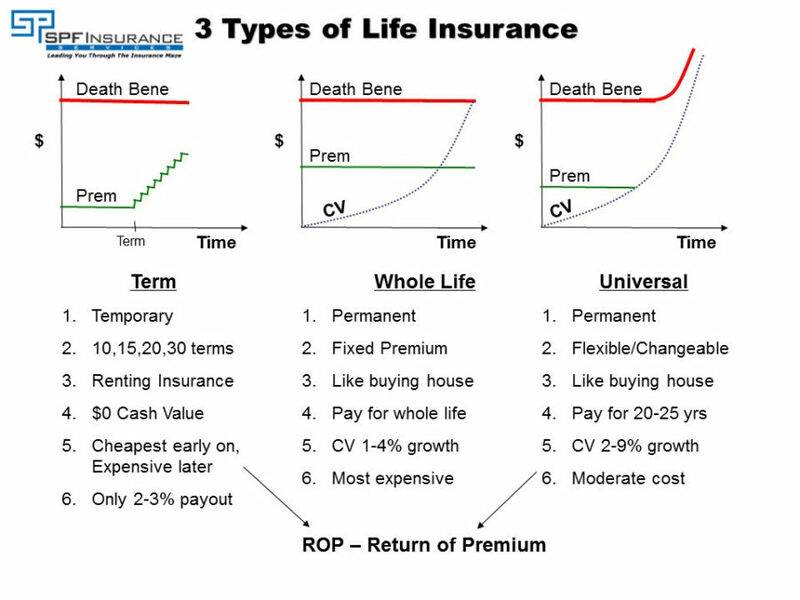 The diagram below provides an overview of how these three kinds of life insurance policies work. We’ll discuss each in the sections below. Term, Whole Life, and Universal Life Insurance Plans - How Do They Work? Term life insurance is the most common type of life insurance. The reason term life is most common is because it is the cheapest type of life insurance when you get it. Term life insurance is used to provide protection for a specific number of years. These term periods can last 10 years up to 30 years (a few companies that will extend these periods to 40 years). Buying term life insurance is like renting an apartment. The lease for the apartment is set to last for a specific period of time (typically 1 year) and as long as you make your rent payments you can continue to live in the apartment. If you stop paying rent, then you get evicted. Term insurance works the same way. As long as you pay the premiums during the term period your death benefit protection will be in place. If you stop paying the premiums your policy ends. How Is The Death Benefit Claimed And Paid Out? If you have a life insurance policy and you pass away, you want your family to be able to get the check from the insurance company with the least of amount of hassle. The steps to make that happen are pretty easy. ​An important thing to remember: Your beneficiaries may not know the details about your policy. Keep your policy in an easy to find location and make sure your family members know where it is. Once they find your policy contract, they need to submit a copy of your death certificate to the insurance company. This is a great time to have them talk to your insurance advisor to make sure they follow the correct steps and know what their options are. When the check arrives, it will not replace you in their lives. It will however, lessen the stress your family is going through with your loss. Knowing that they have the financial means to wait for a while before making decisions about how to go on without you. Having organized financial records will ease the burden of having to figure out the details of the family's finances, and soften the blow for your loved ones to go on without you. Keep a summary of all financial assets and the beneficiaries for each account in a single location -- a well-marked folder in your file cabinet. I recently left the business world to start my own business and for the first time in my life had to seek out my own health insurance. Luckily, I was referred to SPF and specifically Tim Thompson. His website makes finding providers extremely easy, but more importantly, Tim takes the time to break down the pros and cons of each option and does so in a language the average idiot can understand. Had I picked on my own plan without help, no doubt I would've picked the cheapest. I still bought a "cheap" policy but felt much better about my choice after spending some time speaking with Tim. Here are five steps you must follow when buying life insurance. 2. How long does it need to last? 3. What life insurance ratings will you get? Standard, Preferred, Preferred Plus, or Sub-standard? 4. Get life insurance quotes? 5. Select the plan and apply.